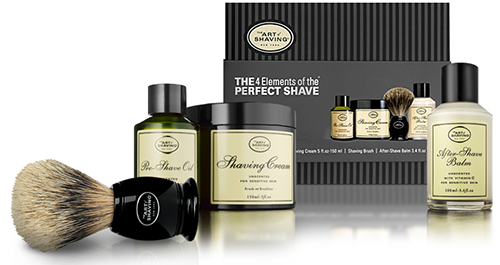 Aromatherapy, natural botanical ingredients, and pure essential oils are the ingredients that The Art of Shaving uses to formulate their high end line of shaving products. All of these elements combine to create a potion that will leave skin flawless – no razor burn, no ingrown hairs, and no nicks and cuts! Aside from The Art of Shaving razor, a great shaving brush is a must. The Art of Shaving Brush is a great tool that spreads a rich, warm lather to your face. It utilizes the finest badger hair available so you get a luxurious experience before you start your shave.